A door opens and you step into an unknown apartment that reveals to the audience an abundance of stories. One of them is this: a Jewish couple, friends with a high-ranking Nazi official, flees from Nazi Germany to Israel. After the war the Jewish couple takes up its friendship with the Nazi official again exactly where they left off, as if the Shoah never happened. They do this without telling the rest of the family. It seems unbelievable but this is the story told in the documentary “The Flat” by Arnon Goldfinger. The director is the Jewish couple’s grandson. He embarks on a journey of discovery to find out what significance history holds for his own actions and his own identity. REMEMBERING spoke to Arnon Goldfinger about the film, the confrontation with his own family history and the importance of remembering. The story that you tell in “The Flat” is truly incredible. Can you tell us how it came about? 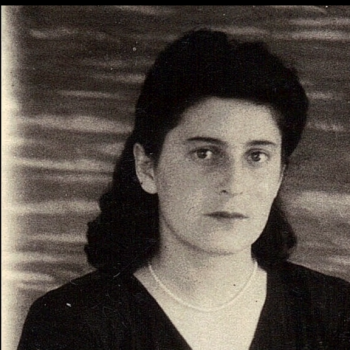 Arnon Goldfinger: My grandmother Gerda lived for 70 years in the same flat in Tel Aviv after she, my grandfather and their children emigrated from Berlin to Palestine at the end of 1936. And then, at age 98, my grandmother died and my family and I were called to the flat to empty out what was left. My filmmaking instinct told me to bring my video camera with me to this meeting. The flat was one in the third floor of a Bauhaus building in the heart of Tel Aviv, however, were it not the view from the window, one might think that the flat was in Berlin. Everything in there – the furniture, the paintings. the books – was from Germany. It was clear to me that soon this unique place would vanish so I wanted to record it for our family archive. I didn’t have the intention of turning it into a documentary. That only came later. If I understand correctly, you didn’t know much about your family history before you began doing research for the film. For example, about the relationship between your grandparents and the Nazi official von Mildenstein. Arnon Goldfinger: I had never heard anything about either of the stories I tell in the film – the story of my grandparents’ relationship with the von Mildensteins and the story of my great-grandmother Susanne Lehmann who was murdered in the Holocaust. Today they are equally important to me. In short, of course I knew about my grandparents’ life but when I began working on the film I realised how little I knew. Your film is more than just the story of a family but also a form of confrontation with the Shoah. How important is active remembrance to you? Arnon Goldfinger: I’ve been thinking about this for quite some time because it’s a big question: What does it signify when you dig up the past? Is it about information? Is it about telling the story of your own family? Yes, but it is also more than that. At first, the protagonist in my film is looking for the truth and finds something deeply disturbing. But why is it important to search for the truth? In my opinion there are two aspects to this. For me it was very significant to uncover the bigger family narrative which transcends my own direct family. It is important to realize that you as an individual are part of a long narrative that influences you and your life, mostly unconsciously. When you get to know your family history, you can see new dimensions of yourself. The other aspect is that my generation in Israel was heavily influenced by the national discourse of pioneers that came to Israel to create the so-called “New Jew”. In that respect the only historical connection that they tried to revive was with the Jewish nation that lived in Israel 2000 years ago – there was a tendency to neglect anything that came from the diaspora. That caused a rupture with their “motherland cultures” in the hearts of many new immigrants. But you can’t live without knowing about your origins. As an individual you have to ask questions: how did I become the person I am, what are my roots? More and more people in Israel are doing exactly this because you can’t base your own identity on a history of just 60 years. Especially as most Israeli Jews are descendants of immigrants. With “The Flat” I not only tried to uncover a story, but also to connect to the past. I believe that no matter how much you try to repress it there will be a time when this past comes knocking on your door. Through my own journey I realised that the second generation, the sons and daughters of Holocaust victims, didn’t dare look back. It was probably too difficult for many of them to ask their parents those painful questions, and many of the first generation (the victims themselves) just didn’t talk about it. But this silence created a wall, an emotional barrier that hurt. Now it is the third generation who must rise to the challenge. How do you feel about the official culture of remembrance in Israel? I think Yom HaShoah, the national Day of Remembrance for the Holocaust, is very important. Sometimes you need official ceremonies like this to start a process of reflection. How this process of remembering takes place and what it takes as its content is changing: times have changed and therefore how we remember has changed. Today we need to find different perspectives and different methods if we want to make it interesting for young people. For my generation this involves seeing the past through our own eyes and not through the eyes of our parents. That’s what I did in the film: I tried to be as open as possible with regard to everything. That enabled me to tell a story that, ten years ago, would presumably not have been told in this way. This leads me to my next question. How was the film received in Israel and Germany? Were there any differences? Arnon Goldfinger: In Israel the film was a huge success. A lot of people saw it, which is unusual for a documentary. A lot of people even went to see the film twice and took their parents or their children and grandchildren the second time because the story I tell relates to their story. Especially when it comes to the silence about the past. I was surprised to find that many people in Israel feel exactly how I feel – I thought it was just something to do with my family. In Germany the film was also very successful even though it is a foreign documentary that deals with a difficult subject matter for Germans, the Holocaust. On top of this, the German protagonists in the film repress or are unaware of their connection to the horrific past. So I was very surprised at how open the German audience was. Maybe one reason for this is that the film actually portraits my grandparents as Germans. My grandparents were German Jews that had to leave their home and homeland. You may say that they actually went into exile in Palestine (and later Israel), but in their hearts they remained Germans, even very patriotic Germans. There was one very interesting difference between Israeli and German audiences. At the end of the film I confront Edda von Mildenstein, who is the daughter of Nazi official Leopold von Mildenstein, with the facts about her father. It is a highly conflict-laden, strong scene that raises many questions. In Israel I sometimes had to deal with criticism from the audience for this scene. They asked me how I dared to treat this nice old lady like that by confronting her with the facts. For me this reaction of the Israeli public is a good sign because I wanted to show Edda von Mildenstein as a victim of her own father and his lies. The fact that so many Israelis were able to identify with her shows how much has changed in how we deal with such a horrific past. In Germany I almost never got this reaction. I learned that people were too embarrassed and ashamed by her reaction to the truth.